Launching IDF - UK Goodness beyond boundaries. IDF-UK launched on 29th March 2014 to spread the message of goodness and connect people for a purpose. Dr. ARK Pillai and Dr. Narayan Iyer congratulated the group for the excellent social initiative of creating a platform of goodness. Interacting with the team members, Team IDF wished Team IDF UK all success in their journey ahead in spreading smiles all around. The spirit of volunteerism was so alive in the discussion that the friends in UK came forward to reach-out the most needy children in IDF Bal Gurukuls and also strengthen TB research work in India. 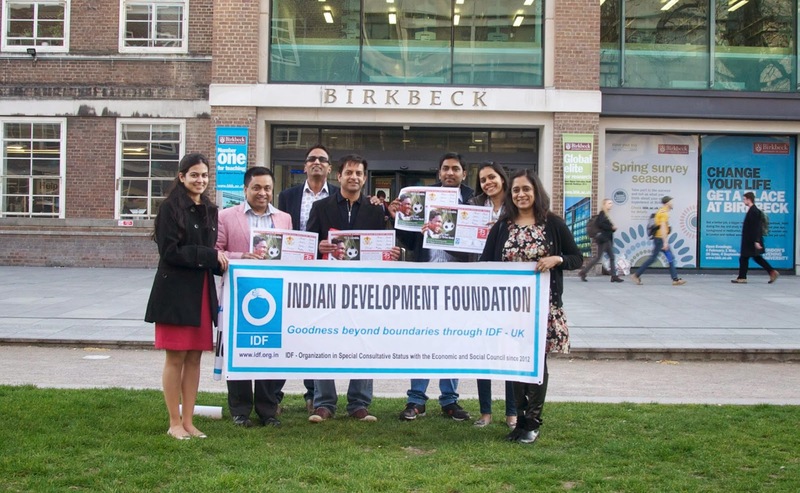 Special thanks and compliments to Mrs. Suja Chandran, Mr. Kishore Krishnan, Dr. Sanjib Bhakta, Ms. Samyukta, Mr. Vishal, Mr. Krishna and Ms. Anu for doing the great launch of IDF UK - Goodness beyond boundaries at Birkbeck, University of London. Social Engineers gear up to spread Smiles. IDF's iLift Club will touch many lives. Our special thanks to DJSCE for inviting IDF to form iLift Club. 151st Bal Gurukul in Goa. 180 students and teachers participated in the rally. Students distributed the pamphlets and display the TB posters/ Charts to the people of the village. 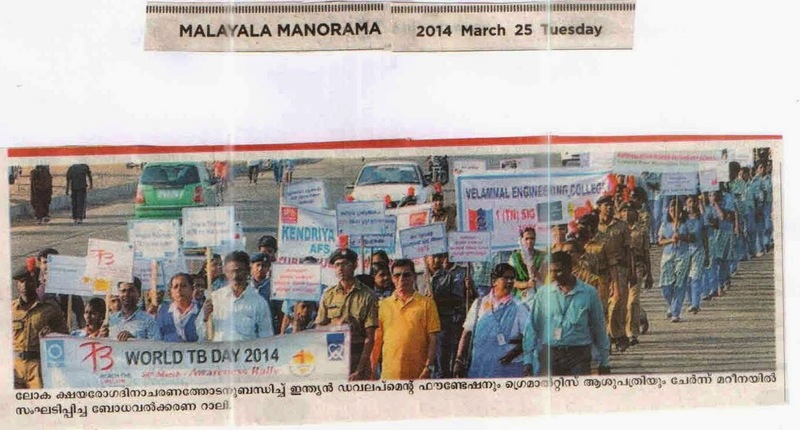 Indian Development Foundation organised a Tuberculosis Awareness rally on Monday to mark World TB Day 2014. Over 600 school and college students took part in the by the rally. 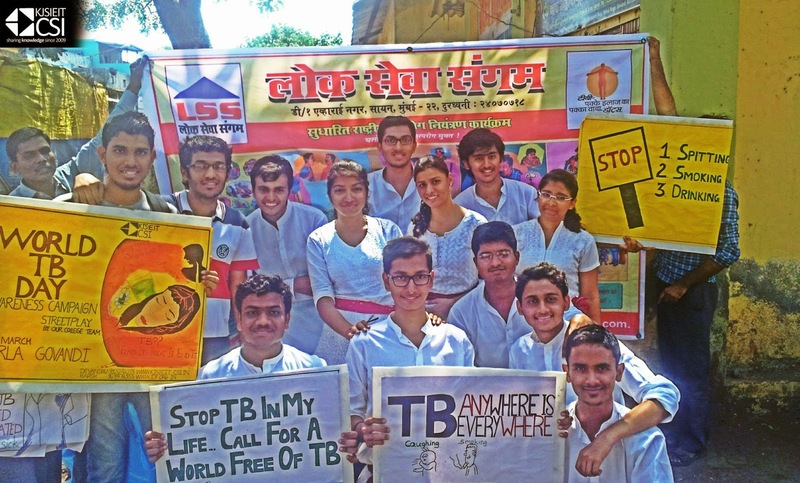 Students from four colleges and schools walked the three-kilometer stretch from the Light House to Labour Statue at Marina Beach holding placards with messages on the symptoms, care and treatment of tuberculosis. “Tuberculosis is a curable disease and as students, it is our duty to spread the message and create awareness,” said Prerna Gupta, a class eight student from Sacred Heart Church Park. Jenima, a class 10 student from Kendriya Vidyalaya, Tambaram, stated that 30 lakh people die across the world due to TB, with three lakh of them in India. “People die of TB because there is lack of awareness. During the rally, people asked us many doubts,” she said, standing along with her contingent of 32 students. Even as the country awaits for the World Health Organisation to announce that India is polio-free, participants at the awareness rally felt that there has to be a collective effort to eradicate tuberculosis as well. “We have been successful in eradicating polio. TB is a common disease and we have come here to put in our effort towards eradicating TB,” said Anirudh, a class 11 student from Kendriya Vidyalaya, IIT Madras. M Narendra, CMD, Indian Overseas Bank, flagged off the rally. S Sreeram, manager, Indian Development Foundation, Tamil Nadu and Pondy was also present at the event. Indian Development Foundation (IDF) and St. Rita middle school Thiruppanthuruthi Village,Thanjavur conducted an TB awareness rally with support from Indian Overseas Bank on account of World TB Day 2014. Headmistress Sr. Yovalmary inaugurate the rally. 300 students and teachers participated in the rally. Students distributed the pamphlets and display the TB posters/ Charts to the people of the village. Rally started from the School and finished at matha temple, thiruppanthuruthi. Mr. Sudhakar lectured the students on TB & Health issues. 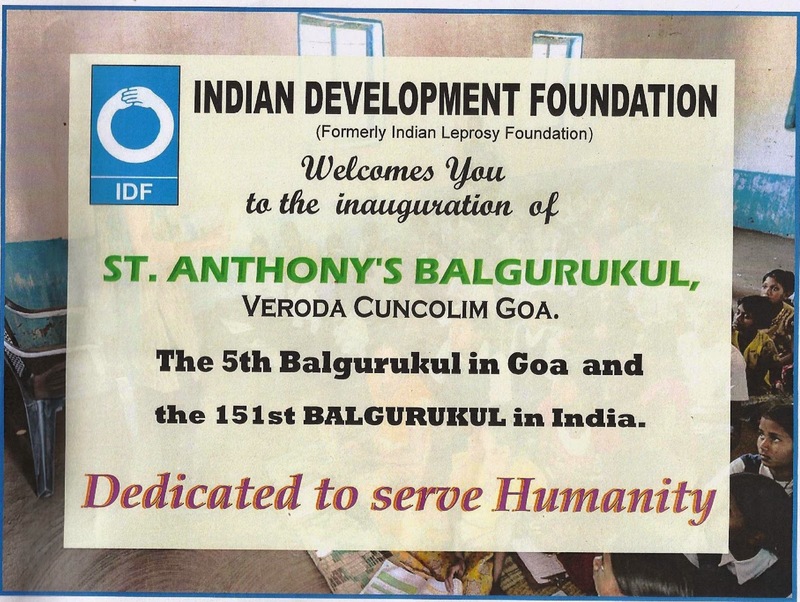 Indian Development Foundation (IDF) and Revised National T.B. 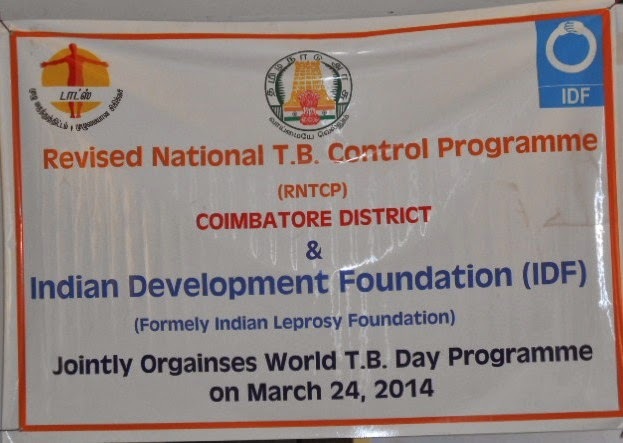 Control Programme (RNTCP), Coimbatore on account of World TB Day 2014 organized a TB awareness programme at District T. B. Centre in Race Course Coimbatore. Chief Guest was Dr. Fathima Bee (Joint Director- Health Services), Guest of Honour was Dr. Sakthivel (Deputy Director- Health Services T.B), Special Invite was Dr. Subramania Raja (WHO Consultant), Dr. Siva Praksam (Corp. M.O.T.C Coimbatore). Mr. Jesudas from NILES, Coimbatore participated in the programme. Awareness posters and pamphlets were distributed to the people and students present. Indian Development Foundation (IDF) collaborated with the State TB Office on account of World TB Day to raise awareness regarding TB and precautions & cure. 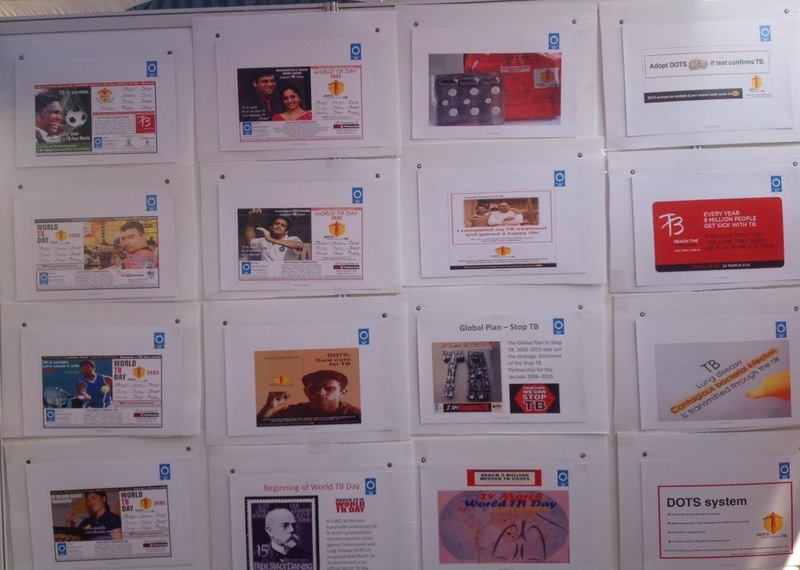 In order to spread the awareness, IDF and State TB office organised an Exhibition & Puppet Show and conducted an essay contest at Freedom Park. Sri. N. Jayaraman, Commissioner, Department of Health and Family Welfare Services, I.A.S., Government of Karnataka was the Chief Guest. Smt. G. Sathyavathy, IAS, Mission Director, National Rural Health Mission, Karnataka was a the special Invitee. People visited the exhibition and enjoyed the puppetry show performed by Ms. Jeyashree Raju. Awareness posters and pamphlets were distributed to people, educational institutions and social organizations. State TB officer, Dr. Suryakanth and Hon Secretary, KSTAB, Dr. Shasshidhar Buggi, presented the cash prize and certificates to the prize winning students. 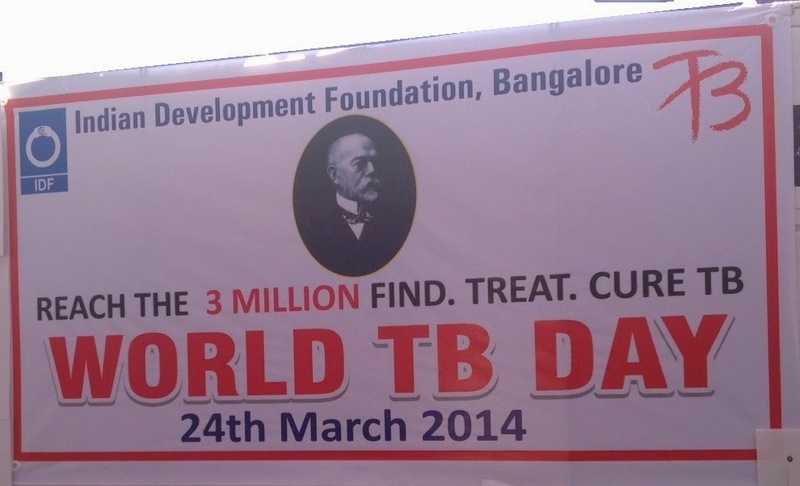 Indian Development Foundation (IDF) conducted an essay contest on account of World TB Day 2014. Topic was "Stop TB - TB Anywhere is Everywhere". About 550 students from 32 different schools participated in the competition. First- Siddharth Bhaganagar, Class IX Delhi Public School, Khajaguda. Second- D.Surya Sai Teja , Studying in Class IX in Sanskriti The School. Third- Simran Jeet Kaur studying in Class IX from KV No 1 Airforce Academy. 7 students was also awarded consolation prizes and participation certificates to all the students. Dr. Nikhil , IDF Social ambassador., Mr. Mustafa, Mr. Ramesh assisted in the event. Ipca Laboratories Ltd.Team joined hands with IDF to present Proteinex tins to TB affected persons in Vimala Centre, Mumbai on World TB Day (24-03-2014). Niveditha Rai, Chitra Pai, Soham and Vidya from Ipca visited Vimala Centre and handed over 104 tins of Protinex for further distribution to TB patients. IDF and Vimala Centre salutes the wonderful gesture Ipca Team. 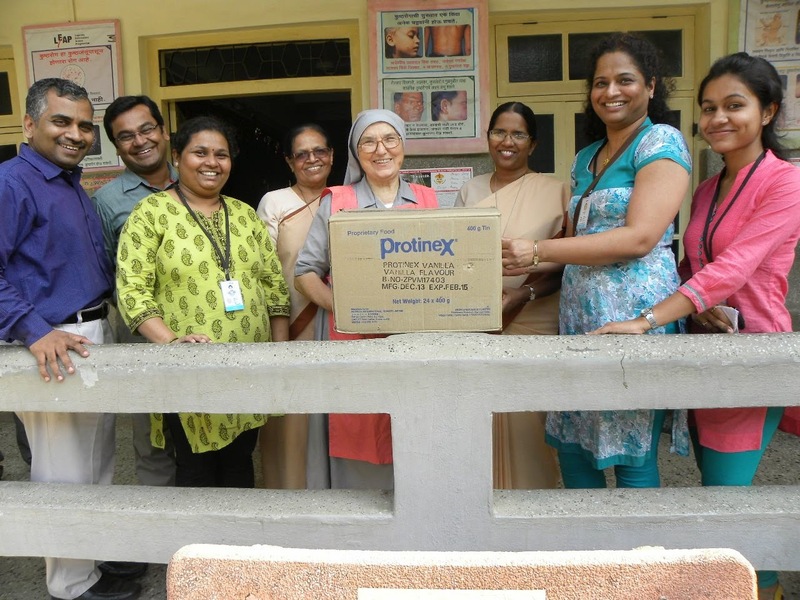 Remaining 96 tins of protinex is handed over to Bombay Leprosy Project for TB patients. CSI KJSIEIT along with Indian Development Foundation (IDF) initiated an awareness campaign for World TB Day. 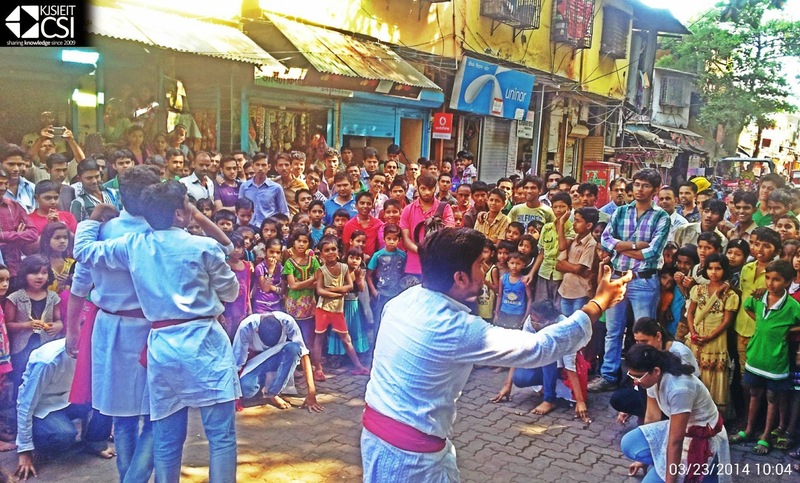 The awareness was spread with the help of a street play by Team Dramebaaz of KJSIEIT. This drive was carried on 23rd of March, 2014 at Thakkar Bappa Colony in Kurla & Rafiq Nagar in Govandi, Mumbai. Indian Development Foundation (IDF), along with specialists from Gremaltes Hospital and in association with Tamilnad Mercantile bank, Indian Overseas Bank & Bisleri Pvt. Ltd. organised an awareness exhibition on World TB Day, to educate passengers passing through Central station at Chennai. Mr. Balasubramani - Station Superintendent, Chennai Central Railway Station inaugurated the TB awareness exhibition. Many people received an awareness pamphlet and good number of them dropped in to read the charts on display in the main waiting hall of the station. Mrs. R. Rajammal, Mr. Sreeram and Mr. Sathyamurthy from IDF co-ordinated the entire even in collaboration with IDF team, social ambassadors, students from Kendriya Vidyalaya No.2, Tambaram, Bharathidasan Scout Group Chennai District, JRD Tata Scout Group Perambur and team from Gremaltes Hospital and other partners. 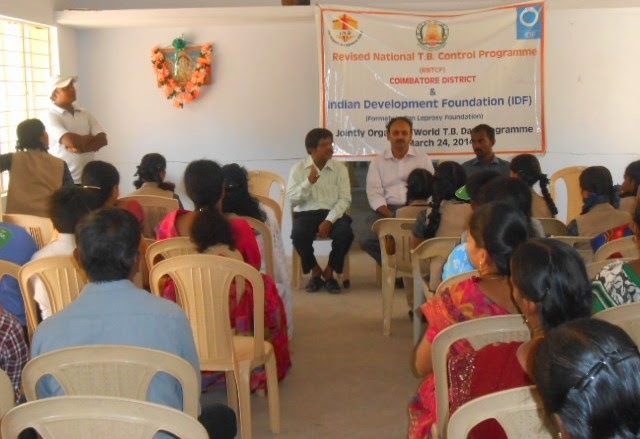 IDF-GMR Varalaxmi Foundation-Indian Oil Corporation Limited (IOCL) awareness program. Indian Development Foundation (IDF) and Road safety club conducted an awareness program in GMR Varalaxmi Foundation & Indian Oil Corporation Limited (IOCL) on TB and road safety.This program was coordinated and conducted by IDF and Road safety club for the road safety coordinators of GMR group IOCL who oversee the awareness programs on highways manned by GMR group. 20 participants from Hyderabad - Bangalore, Hyderabad - Vijaywada and Hyderabad - Nizamabad highways and 40 drivers and staff of IOCL participated in the program.This was arranged in GMR Foundation campus which is located in Hyderabad Shamshabad airport. Senior Plant Manager Mr. Parmeshwar, Ramky Foundation and L&T personnel also participated in the program. Mr. Santosh from St. Johns Ambulance spoke on First Aid.Mr. Sanjay from IDF and Dr. Srinivas and Dr. Gitanjali from Road safety club coordinated the program. On the eve of International Women's Day programme IDF organized a program in St. Thomas Mar Thoma School, Mumbai. The parents of the school children who are the members of the Sarva Sakhi Swabhiman (S3), Women Empowerment Project at the school were the invitees for the event. Ms. Meghna Popat- IDF Social Ambassador and a Clinical Psychologist spoke on the need of counselling to the present generation children and how mothers can be the Counselors. She also highlighted the importance of listening and understanding to the children's demands and needs. Ms. Shayada Sayani- IDF Intern and a Nutritionist highlighted the importance of the right diet. She also explained the parents, who is a healthy child? and how to keep track of the child's BMI (Body Mass Index)?. IDF also donated three sewing machines to the empowerment group and provisioned for teaching the tailoring skill. The parents were happy to receive the machines and expressed their thanks & desire to learn tailoring. IDF appreciated the efforts of the teachers; Ms. Devi Nadar, Ms. Sangeeta Taksale, Ms. Mercy Francis and Principal Ms. Joice Dias towards the empowerment group. Dr. Narayan Iyer and IDF Educational Ambassador Mrs. Rekha Bajaj congratulated the parents and motivated them to continue with and excel in their efforts. 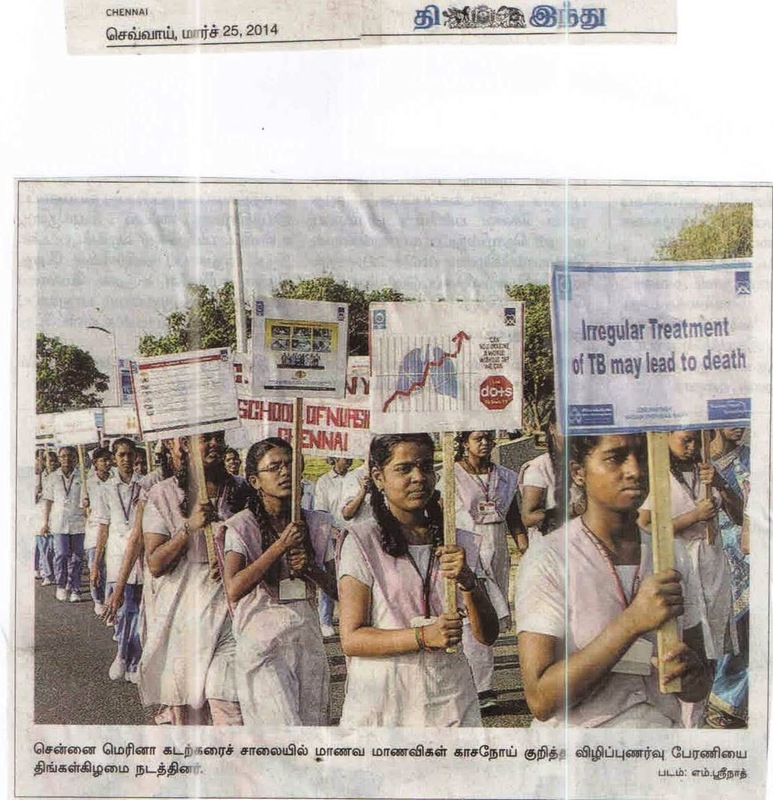 Postal Department Chennai City Region supports TB Awareness programme during World TB Day 2014. Mr. S. Sreeram, Manager, IDF presenting a poster to Mr. Mervin Alexander, Post Master General, Chennai City Region. IDF thank the Postal Department for their excellent social support. On the eve of International Womens day programme IDF AP organized a program in Sanskriti School, Hyderabad & Nalgonda. The parents of the school children and women from the locality were the invitees for the event. Mr. Sanjay & Mrs. Swati Principal , Sanskriti School spoke for the equality of the women and also distributed greeting cards specially prepared for the event. Mrs. Vijayalaxmi, Founder, Center for Social service was felicitated for her excellent service to girl child and education to girl child. 5 more women (mothers of the school children.) who have excelled in their respective fields were felicitated. Mr. Sanjay spoke on the “He for She” campaign urging men to stand up for the rights of their mothers, sisters and daughters. Dr. Srinivas , Road Safety club spoke on road safety for women. IDF and Road safety club launched the 1st Junior Road Safety club for children in Sanskriti School. Skits/ Plays were performed by the children. The initiative earned appreciations from many. Dr. Sampath Goud , Research physician from National Institute of Nutrition on "Health and Nutirtion for Women and Child - Simple tips for health issues, prevention and how to lead a better life". Assisting Dr. Sampath were IDF social ambassadors Dr. Nikhil and Dr. Sravan. 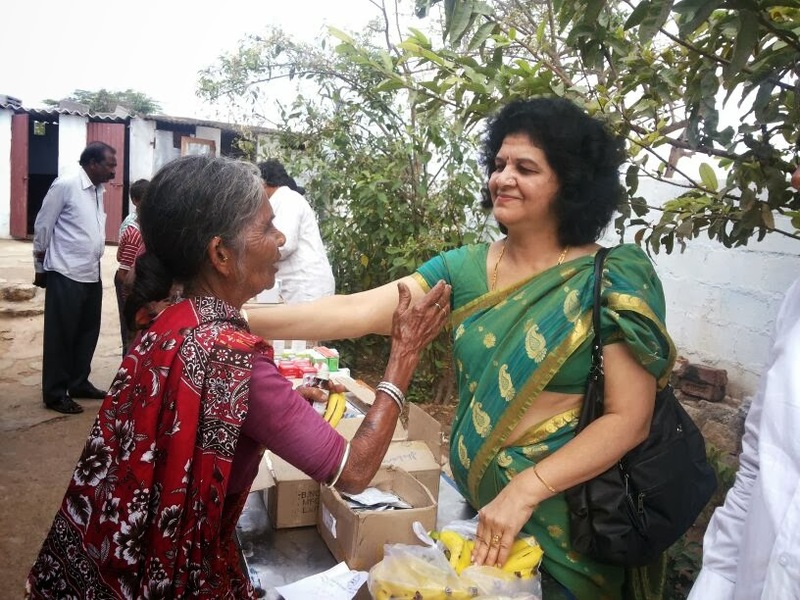 A similar programme was organized at Nalgonda where IDF social ambassador Mrs. Chetna Bhatia in association with IDF Ashirwad SSS organised a health camp for women. Local doctors volunteered, Mr.Chandrashekar from Blood donor club arranged for free medicines. Indian FOOTBALL legend I.M. 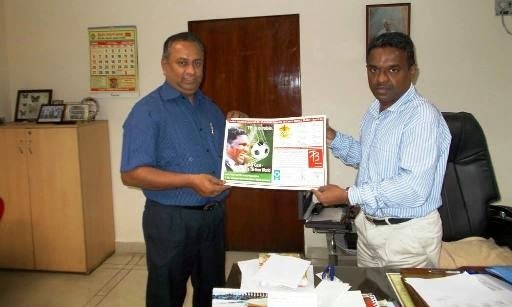 VIJAYAN supports TB cause. "Let's kick out TB and bring smiles"
Indian Development Foundation (IDF) thank Indian football legend I.M. Vijayan for supporting the cause. IDF also thank World's No.1 Anti-TB Company, Lupin Pharma for supporting the TB Awareness Campaign for World TB Day 2014. The newly designed Multi-lingual TB Awareness Posters will be available for distribution at educational institution/ Banks/ Corporate offices/ Trust Offices/ Co-operative Housing Societies and many other public spots for creating an impact during World TB Day. Do write to idfindia@gmail.com for TB posters and spread awareness. 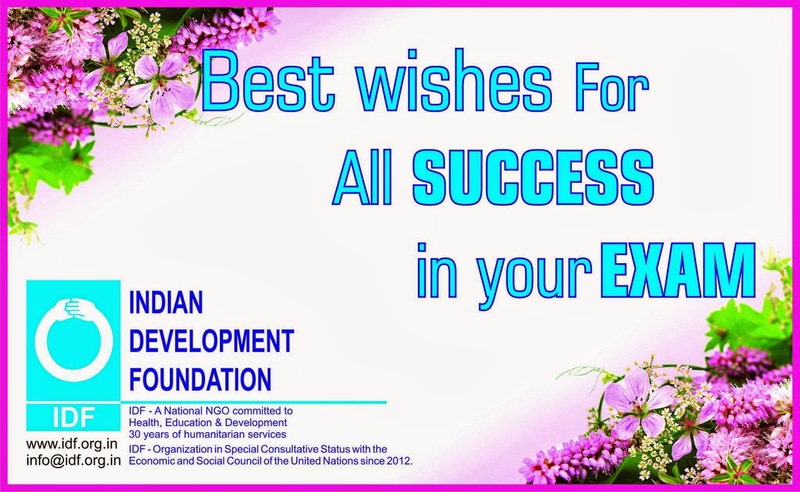 Best wishes for all success in exams. As students are gearing up for exams. Team IDF conveys best wishes. IDF launched SENTHAMIZHIL BAL GURUKUL at St. Michael's High School, Madha Kottai, Thanjavur, Tamil Nadu to help children coming from the remote pockets and also from leprosy colony. Our special thanks to Rev. Fr. Arockia Anthony Raj, Headmaster of the school for extending all support. Ms. Manimala, Development Executive of IDF did the co-ordination in opening the Bal Gurukul. IDF is committed to empower and ignite young minds. On National Science Day 2014 - Indian Development Foundation (IDF) launched two Bal Gurukuls at Chennai. Sir C.V. Raman Bal Gurukul for boys and Prabha Rajan Bal Gurukul for girls. Mr. Rajan was the chief guest for the function. He spoke about benefits of good education and encouraged the students to study well, also promised all possible support from his side. The students are from the Corporation Middle school, Thamodharapuram, Adyar, Chennai. The Bal Gurukul children are street children and the Chennai Corporation has given the responsibility of the education of the children to Montfort Siragugal. In the school campus children are provided with boarding facilities. It is a pilot project by Govt of Tamilnadu. Rev. Bro. Mark appreciated the support extended to the children by Mr. Rajan and IDF.